Also: Thai protestors trade banners for brooms, nearly 20k evacuated in Malaysian floods. The Pontianak District Court in Indonesia has freed two men who were arrested for killing and eating an orangutan last month. While the hunting of the great ape is illegal under Indonesian law, the court ruled that their arrests were made illegally. 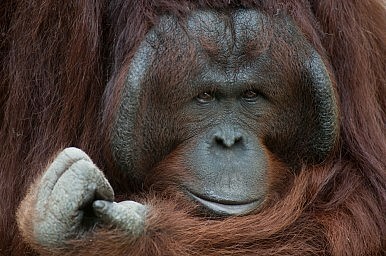 The defendants claimed that they only ate the orangutan after finding it dead. While the men have been freed from prison, the case is still open. It is up to prosecutors whether they pursue pressing criminal charges. If found guilty of killing the orangutan, an endangered species, the men could face up to five years behind bars and a $8,000 fine. Over in Thailand, while some anti-government protestors continued demonstrations in front of the Bangkok police headquarters, many have taken to the streets to clean instead. The sometimes violent rallies came to a relative standstill compared to earlier in the week as both sides of the debate joined forces out of respect for their beloved King Bhumibol Adulyadej. The world’s longest-serving current head of state, King Bhumibol celebrates his 86th birthday today. “Some protesters, along with government forces, have been cleaning the area around the Democracy Monument, where celebrations for the king’s birthday are expected to be held,” reported the BBC. Anti-government Yellow Shirts have been clashing with pro-government Red Shirts and the police since late last month. The Yellow Shirts claim that Prime Minister Yingluck Shinawatra is merely a figurehead for her exiled brother, former prime minister Thaksin Shinawatra. Four people have been killed since protests took a vicious turn on Saturday. Severe flooding in Malaysia has forced authorities to evacuate nearly 20,000 residents along the coastal states of Pahang, Terengganu, and Johor. The region has been battered by monsoon rains since last month. Channel NewsAsia also reported that a 17-year-old boy was killed after being swept away by a swollen river. Officials from the Malaysian Meteorological Department said that rivers will continue to rise due to high tides and the release of water from local dams, but that heavy rains are likely to subside by the end of the week. At-risk residents in the flood zone have been moved to evacuation centers set up at area schools.